With a staff of two and some assistance from horticulture program students and JSRCC Horticulture Club members, the soon-to-be yet not-ready for prime time yet ACS Reference garden on the campus of J. Sargeant Reynolds Community College, Western Campus (in Goochland, Virginia, between Richmond and Charlottesville) has come a long way over the past year, thanks in large part to Horticulture program head David Seward's wise stewardship of ACS seed money as well as his persistent efforts at getting donations of materials from area businesses. 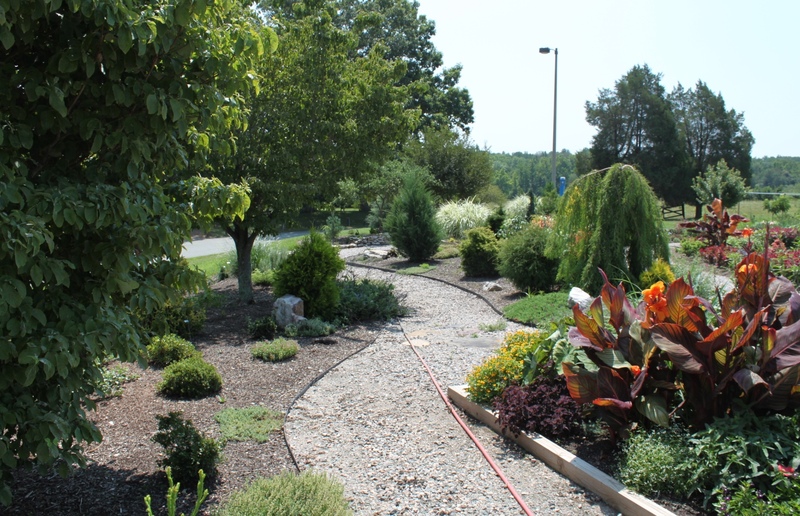 Colesville Nursery and Glen Allen Nurseries have been major donors of said plant materials. 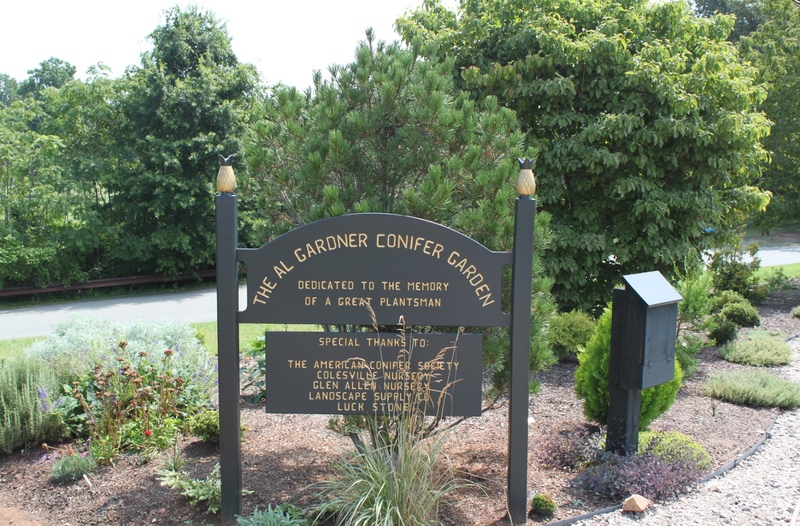 The Al Gardner Memorial Conifer Garden will serve a multi-dimensional role as teaching garden, special events site, and as a living memorial to one of the Richmond region's great plantsmen, Al Gardner (1956 - 2007) who co-owned Colesville Nursery in Ashland Virginia as well as co-founded (along w/ Elizabeth Mundy) Acer Acres, a Japanese maple specialty nursery nearby. 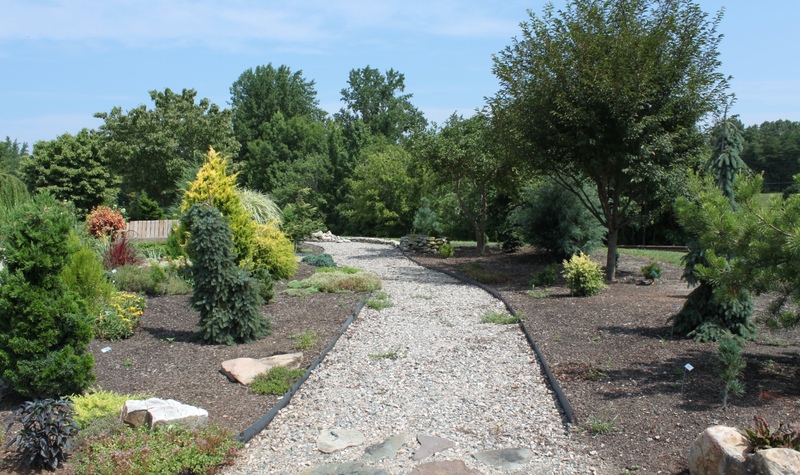 Al loved conifers and pushed for their greater use in home landscapes. So where are we now? The design is in place on the ground with loads of amended soil added to create low berms bisected by gravel walks and retained with metal edging. Signage is under construction as well as a literature box. Students have interplanted low growing thymes donated by Sandy's Plants, a Mechanicsville wholesale/retail nursery. 37 conifer specimens representing 11 different genuses are currently in the garden. Some of note include: Pseudolarix amabilis, Pinus bungeana, Juniperus rigida 'Hikaria' Picea omorika 'Pendula Bruns,' and a potential new yellow sport introduction off Cryptomeria japonica 'Sekkan' called Cryptomeria japonica 'Lemonade'.